EZOnlineDocuments has been enhancing shareholder communication since 1998. 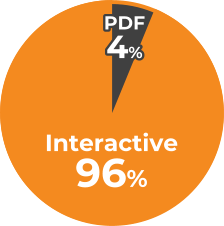 By providing Interactive Documents with enhanced features, we can replace the PDF version of your important documents to make your Annual Reports, 10-Ks, Proxy Statements, Sustainability Reports, and more accessible to all your investors and clients. See the articles listed below for our studies on points of interest or use our menu system to find our products and features you are interested in, then contact us today for a free consultation for your project. MEET the BOARD transforms the board nominee information in a company's Proxy Statement from the traditional multi-page, designed-for-print style into a completely interactive online experience. The best Proxy Statements of the S&P 500 presented their nominee information in improved ways for investors. In our 2017 S&P 500 study, the S&P 500 had a 60% adoption rate of using enhanced methods to present nominee information, including photos, skill lists, committee membership highlights, and more. To highlight the state of the art presentation methods, we conducted a focused review on companies in our 2017 S&P 500 study who had an enhanced nominee presentation and also used an HTML/Interactive approach for online delivery. If you currently have a proxy summary or are considering adding one to your Proxy Statement, what content should you consider including in it? To help answer that question, EZOnlineDocuments has completed a review of the top twenty listed S&P 500 companies that have a proxy summary to see what content their summaries contain. Review the trends for tablets and mobile devices. EZOnlineDocuments has pulled together research to show you the reality of the shift toward mobile internet use. In 2018, for example, more Americans owned a smartphone than a desktop or laptop. Additionally, more than half of all Internet traffic is now mobile. EZOnlineDocuments does an annual review of the S&P 500 that includes both their Annual Reports and Proxy Statements. This allows you to see how standards are changing for online documents and if your online documents measure up to those of major companies. What is responsive page design (and why care about it)? 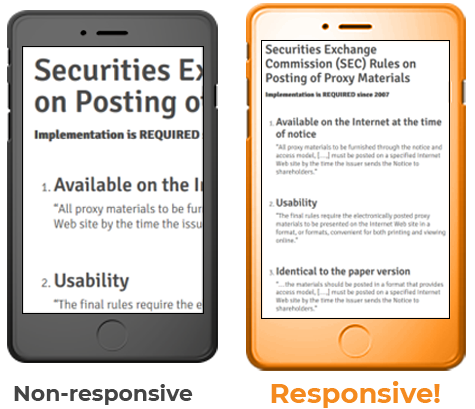 Learn about responsive design, why it is important, and what specific issues financial documents have with supporting mobile users. EZOnlineDocuments has conducted research and gathered data from our own clients’ hosted documents to show trends in how investors view online documents.